The ground-breaking ceremony for the hydro power plant Broadland was held recently with a touch of difference. 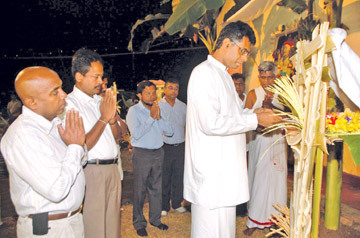 Though usually Seth Pirith is chanted to invoke blessings at a ground-breaking ceremony of this nature, the Ceylon Electricity Board (CEB) this time around decided to have a Bahirawa Pooja in a bid to "get assistance from the gods and devils". There was a very good reason for this. The Broadland power project was to have commenced 20 years ago. The plans had already been submitted. However, the project never got off the ground with various excuses such as the lack of funds, environment constraints being put forward. 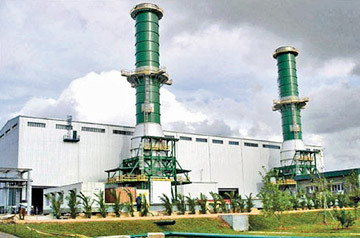 There was also speculation that companies providing diesel-generated power to the CEB were behind this delay as their business would be at stake with more hydro-power generated projects being implemented. The CEB buys a unit generated via hydro power for around two rupees while around Rs12 is paid for a unit generated from thermal power. However a decision was finally taken recently, tenders were called for and the contract was to be awarded to a Chinese company which tendered the lowest bid. The cost of the project was USD 82 million. It was due to these controversies that the CEB needed not only the support of the gods, but also the blessings of the devils before the project got under way even in times the Minister is planning to introduce nuclear energy to Sri Lanka. However, there was pressure that the project be handed over to a bidder who was quoting around USD 120 million. The pressure was so intense that some of the high-ranking officials of the CEB had to flee the country as they faced death threats. Finally the matter was ironed out with China National Electric Equipment Corporation being awarded the tender with the pledge that the project be completed by 2014. Professor Mudiyanse Dissanayake of the Colombo University, who was in charge of the pooja, said that these prehistoric traditions have being performed even before the Buddha was born. "When a new building is constructed, these rituals are carried out even now. If there is no benefit in them, will these traditions still be practised?" he asked. 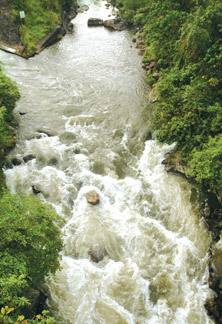 Broadlands Hydro Power Project will be constructed over the Kelani River, near Kitulgala, with a tunnel taking the water nearly six kilometres to the power house. The CEB says that the project can prevent carbon emissions by 86,000 metric tons per year. The State can earn USD 2.4 million per year through carbon trading. The project will have an installed capacity of 35 MW and expects to generate 126 GWh of electrical energy annually. Minister of Power and Energy Champika Ranawaka said that hydro power was one of the keys to turn the CEB around from a loss-making institution. He said that people may be surprised to learn that a family using kerosene lamps spends more than a family using electricity. 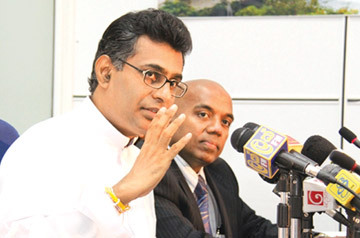 "This is one reason for us to fast-track our project to provide electricity for all by 2012," the Minister said. The CEB, which had been written off as a loss-making institution, becoming a major financial burden on Government coffers, has made a dramatic U-turn and reported profits. The institution, which was expected to end the last financial year (2010) with a Rs. 40 billion loss, has turned around and has posted a Rs. 5 billion profit. The key to this turnaround as mentioned by Minister Ranawaka at a recent media briefing is short-term plans to resurrect the institution, which has yielded positive results. "This is no fluke or a surprise to us. This is a result of coordinated efforts by employees of the CEB. The regular rainfall during the last financial year also helped the CEB to turn around", the Minister said. It is after 10 years that the CEB has reported profits. It was possible to avoid taxing the people the additional Rs. 2,000 irrespective of social status. Thus it is considered a victory for the people more than an achievement for the CEB, he said. He said that profit has been recorded after the CEB settled all its dues regarding purchases it had made in the 2010 financial year. Hence, for the first time in history, during 2010, the CEB has settled all dues payable to the Petroleum Corporation within the year. Several media organisations were of the opinion that the Petroleum Corporation was incurring losses due to the payments due by the CEB. They said that due to the CEB purchasing heavy fuel at Rs. 40 per litre from the Petroleum Corporation, where the actual cost is Rs. 81. a 50 percent loss was incurred by the Petroleum Corporation. The CEB had, up to August 31, 2010, purchased heavy fuel from the Petroleum Corporation for a mere Rs. 26. Upon the request of the Petroleum Corporation, discussions were held and the amount was increased to Rs. 40 per litre. This decision was reached with the intervention of the Ministry of Finance. Furthermore, diesel will be purchased according to the normal market rate; NAPTA purchases it for Rs. 42. In the production process of petroleum, heavy fuel is a residual product after the purification process of diesel and petrol. It is 38 percent of the entire process. The remnant heavy fuel percentage is far greater than all petroleum products. As a solution to this the CEB has set up thermal power stations such as Sapugaskanda. A major factor was that the Petroleum Corporation agreed to supply the heavy fuel which it had no use for, free to the CEB. Therefore, it is obvious that the Petroleum Corporation is not incurring losses due to the supply of free heavy fuel, but rather due to long-standing problems in the purification process, Minister Ranawaka said. Before December 31, 2009, the dues owed to the Petroleum Corporation by the CEB which was Rs. 52 billion was covered by Treasury without burdening either the CEB or the Petroleum Corporation, he said. "In addition to the profit, CEB is being converted to a people-friendly institution. Unlike in the past today one could call the CEB and talk directly with an official or make a complaint and expect an officer to call back." The CEB has also taken a bold initiative to electrify the entire country including the North and the East by the end of next year. Apart from preventing electricity tariff hikes, the Board is also looking at alternative energy sources which include nuclear power.